In American politics, the National Rifle Association (NRA) has asserted itself as a leading voice in the gun rights movement. 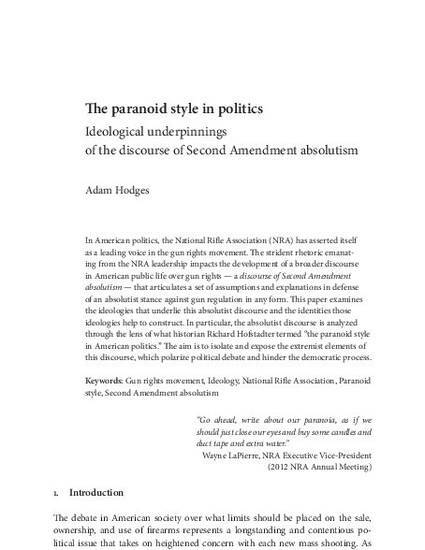 The strident rhetoric emanating from the NRA leadership impacts the development of a broader discourse in American public life over gun rights — a discourse of Second Amendment absolutism — that articulates a set of assumptions and explanations in defense of an absolutist stance against gun regulation in any form. This paper examines the ideologies that underlie this absolutist discourse and the identities those ideologies help to construct. In particular, the absolutist discourse is analyzed through the lens of what historian Richard Hofstadter termed “the paranoid style in American politics.” The aim is to isolate and expose the extremist elements of this discourse, which polarize political debate and hinder the democratic process.